The Battle Bluff State Natural Area has a lot to offer history buffs as well as nature lovers. Battle Bluff gets its name from the Black Hawk War of 1832, a tragic fight for land between members of the Sauk Nation and the United States. The Sauk warriors would use the high bluff to evade U.S. soldiers and to find a safe place to cross the Mississippi River. By the end of the Black Hawk War only 150 of some 1,200 members of the Sauk Nation survived. Despite this tragic history, Battle Bluff has ecological treasures that can be found in only a handful of other places. The steep south-facing dry prairie of the bluff creates rising thermals of hot air that are well known and often-used by migrating birds of prey. You can see American kestrels, peregrine falcons, butterflies, rare plants such as cliff break and Canada yew, as well as 80 other Wisconsin native prairie plants like milkweed, prairie phlox, bird’s foot violet, and little blue-stem. You’ll also find many beautiful butterflies and other pollinators keeping busy on the diverse prairie flowers. The work of these pollinators is crucial to helping the native plants reproduce and spread. For fitness enthusiasts, Battle Bluff offers a challenging climb through steep terrain, with the reward of a gorgeous view of the Mississippi River Valley. Today a very different kind of battle is waged at Battle Bluff SNA: A battle against invasive species to save the native prairie habitat. This year, the Battle Bluff State Natural Area has received more than $3,800 from the Wisconsin Conservation Endowment to help fund these efforts. The SNA management crew has a very thorough and proactive plan set up for this year’s restoration work. The crew will focus on four acres of land that require the removal of invasive plant species; this work will be done both by hand and with chemical treatments. Another 79 acres of land in the State Natural Area have been designated for other invasive management tactics like prescribed burning. Additionally, rare species population surveys are planned, as well as a series of seed collections to help spread and propagate native prairie species like those already mentioned as well as blazingstar and leadplant. Funding from the Wisconsin Conservation Endowment will help the State Natural Area crew and their volunteers continue their work to restore and preserve this unique and historic place in Wisconsin. 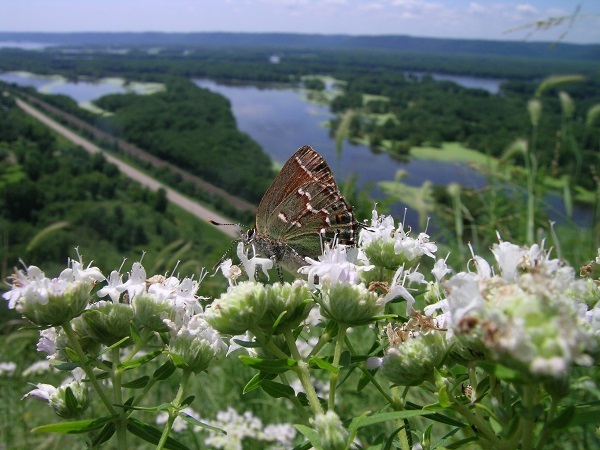 To learn more or plan your next trip to Battle Bluff SNA visit Wisconsin DNR.